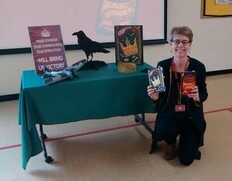 Over 600 children from across East Sussex have met an author this month, with their school, at our East Sussex Children's Book Award author events. All five of the shortlisted authors for this year's Award have visited local schools and libraries across the county, inspiring primary school children to read and write stories of their own. From magic tricks to Anglo Saxon burial grounds, our authors have not failed to delight, entertain and educate young book lovers. Schools taking part in the 2019 Award have been involved in voting for a shortlist of five books, which they are now reading and sharing with one another. As well as being given the opportunity to meet the authors, children are invited to design a book jacket and take part in creative writing and book review competitions. They also have the chance to vote for their favourite book and see the winning author presented with their prize at a final event ceremony in June. All of the books are available to borrow from our libraries as well as on our eBook site. For more information about the Award please visit our website. April is Stress Awareness Month and a chance to reflect on how daily stresses can impact on your health and happiness. Whist some stress is unavoidable, there are things we can all do to minimise the negative effects it can have on us. Mindfulness, exercise, sleep and hobbies such as reading, gardening and walking are all great ways to relieve stress and the library has a variety of resources to get you started. Search our catalogue for a wide selection of books on healthy eating, fitness, sleep and guides to improving your mental health and reduce stress. The Reading Agency has a great mood boosting collection, all of which are available in East Sussex Libraries. For a more holistic approach, why not borrow one of our free wellbeing boxes with a variety of information and interactive resources to help manage the whole of your wellbeing? On Saturday 11 May, join children's poets Brian Moses and Ed Boxall in Hastings library for a fabulous performance of poems from their recent books. Brian will be performing poems from his collection 'I Thought I Heard a Tree Sneeze' and Ed will be performing from his collection 'Me and My Alien Friend'. Brian and Ed are well known in local schools for their dynamic performances - Brian accompanies his poems with percussion, Ed with guitar. Expect a fantastic range of poems and lots of fun and joining in. There will also be a chance to buy signed books from Brian and Ed. On Saturday 27 April we are inviting teachers from schools across East Sussex to browse our special collection of stock that has been carefully selected to support teaching and the curriculum. Visit our warehouse in Hailsham to choose up to 40 books to borrow free from our Teachers’ Collection. You can sign up for membership online or come along to find out more and get your card on the day. You will also have the chance to buy selected stock at £2 per book. Invitations will be out shortly in the virtual school bag so keep an eye out for this great opportunity to refresh your school library or classroom collection. For more events in your local area, including local information and support, visit ESCIS. 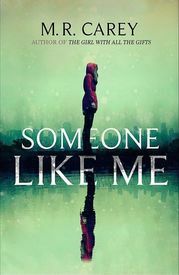 This month our Librarian Tamsyn has reviewed Someone Like Me by M.R. Carey. When Liz Kendall suffered a brutal attack from her ex-husband, there was a moment where she thought she would die. Except part of her would not allow her to die, would not allow him to win. Now that once-forgotten side of her refuses to disappear, leading her down dark paths she would never tread on her own, with devastating consequences. Across town, Fran tries to deal with her own trauma, after being abducted as a child. Her world is a frightening one, overlaid with hallucinations where the people and environment around her change before her eyes. Her sole constant is the imaginary fox, Lady Jinx, the only one who can see something dark in picture-perfect Liz. Liz’s character could be plucked from the pages of a crime thriller, while Fran would feel at home as the champion of a young adult fantasy novel. However, Carey’s masterful blending of genre makes the interaction of these disparate characters feel wholly realistic. Highly recommended to fans of psychological thriller, paranormal fantasy or King-esque situational horror. Reserve your copy from an East Sussex Library now or download the audio book for free. Looking for more reading inspiration? Our librarians review their monthly top five picks for April on the Your East Sussex website. 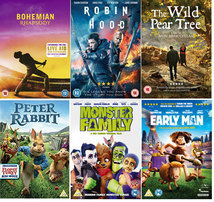 If April showers are keeping you indoors this month, why not entertain the family with our new DVD releases? From Bohemian Rhapsody to Peter Rabbit, there's something for everyone this Easter.